In classical mythology Gyges was a shepherd who discovered a magical ring that could make him invisible. Armed with his new power, Gyges eventually killed the king, married the queen and seized the throne. ‘Invisibility’, [Grégoire] Chamayou notes, ‘conferred upon him a kind of invulnerability.’ In Plato’s Republic the story is used to ask searching questions about virtue and justice: what happens to morality, to virtue, if it becomes possible to evade responsibility for one’s actions? The dilemma is no longer confined to the realm of story-telling or philosophical speculation, Chamayou argues, because the thought-experiment has been realised through the political technology of the drone. The modern answer to Plato’s question is now all too clear: invisibility produces not only invulnerability but also impunity. In the sixteenth century, [Grégoire Chamayou says,] the iconography of Death often portrayed a soldier fighting a skeleton – most famously in Holbein’s Dance of Death – in a struggle that was always pointless because Death mocked his adversary and always triumphed in the end. 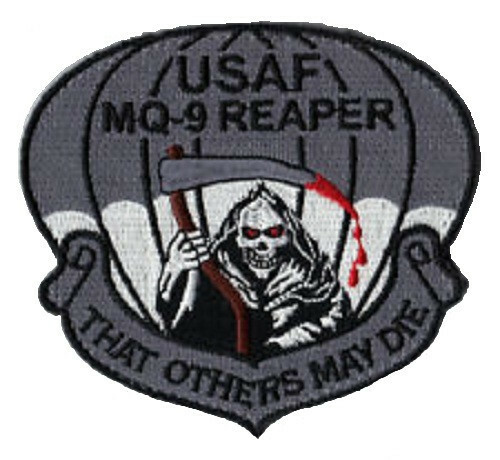 The imagery has now been appropriated in this unofficial patch produced for Reaper crews, where the soldier now assumes the position of Death itself (and becomes synonymous with the MQ-9 Reaper); the slogan – which is in fact a parody of “That others may live”, used as a patch by the USAF’s Pararescue teams – gives Chamayou the title for his chapter.